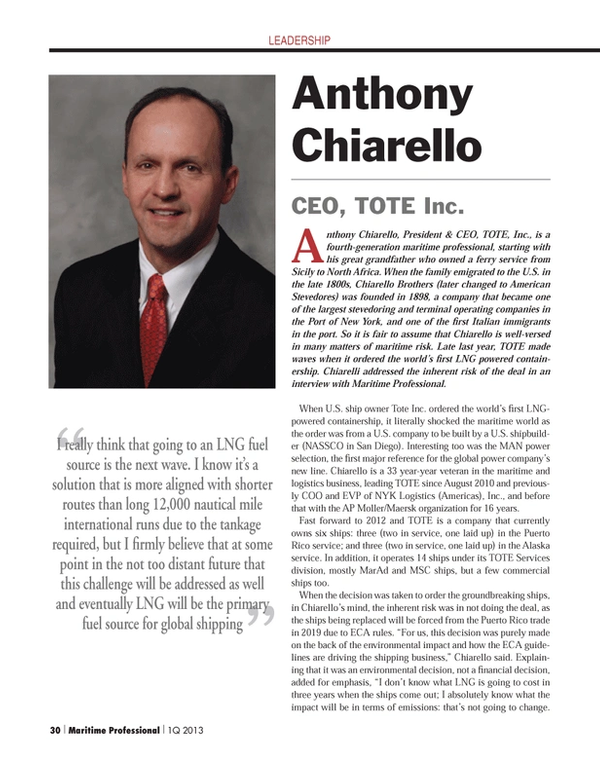 Risk Breakers: Anthony Chiarello, CEO, TOTE Inc.
Anthony Chiarello, President & CEO, TOTE, Inc., is a fourth-generation maritime professional, starting with his great grandfather who owned a ferry service from Sicily to North Africa. When the family emigrated to the U.S. in the late 1800s, Chiarello Brothers (later changed to American Stevedores) was founded in 1898, a company that became one of the largest stevedoring and terminal operating companies in the Port of New York, and one of the first Italian immigrants in the port. So it is fair to assume that Chiarello is well-versed in many matters of maritime risk. Late last year, TOTE made waves when it ordered the world’s first LNG powered containership. Chiarelli addressed the inherent risk of the deal in an interview with Maritime Professional. When U.S. ship owner Tote Inc. ordered the world’s first LNG-powered containership, it literally shocked the maritime world as the order was from a U.S. company to be built by a U.S. shipbuilder (NASSCO in San Diego). Interesting too was the MAN power selection, the first major reference for the global power company’s new line. Chiarello is a 33 year-year veteran in the maritime and logistics business, leading TOTE since August 2010 and previously COO and EVP of NYK Logistics (Americas), Inc., and before that with the AP Moller/Maersk organization for 16 years. Fast forward to 2012 and TOTE is a company that currently owns six ships: three (two in service, one laid up) in the Puerto Rico service; and three (two in service, one laid up) in the Alaska service. In addition, it operates 14 ships under its TOTE Services division, mostly MarAd and MSC ships, but a few commercial ships too. Mitigating the risk is the fact that TOTE already has LNG experience under its belt, as last August it announced the conversion of its Alaska ORCA class ships to LNG. “So we had already spent a lot of time looking at LNG as an alternate fuel source. There was no doubt that the ships were going to be dual fuel and that LNG was going to be the primary fuel source. That was never a question,” Chiarello said. But anytime a shipbuilding deal comes with the tag “World’s First” there are natural questions. The first and last questions of risk on this deal are LNG, or more accurately, the ready supply of LNG to his ships. As of now, the infrastructure simply does not exist. While the U.S. continues to power forward and rapidly expand its discovery and recovery of natural gas, there remains a dearth of LNG bunkering stations here and abroad, presenting a classic ‘chicken and egg’ scenario: build the ships and hope for the bunkering infrastructure; or build the bunkering infrastructure and hope for the ships. Though it is the only remaining piece of the puzzle, Chiarello is betting the bunkering market will follow in kind. With four generations of maritime risk management and mitigation in his DNA, odds are strongly in favor of Chiarello and TOTE working it out to commercial advantage. (As published in the 1Q edition of Maritime Professional - www.maritimeprofessional.com). Mr. Chiarello was one of four leading maritime executives profiled in this coverage.